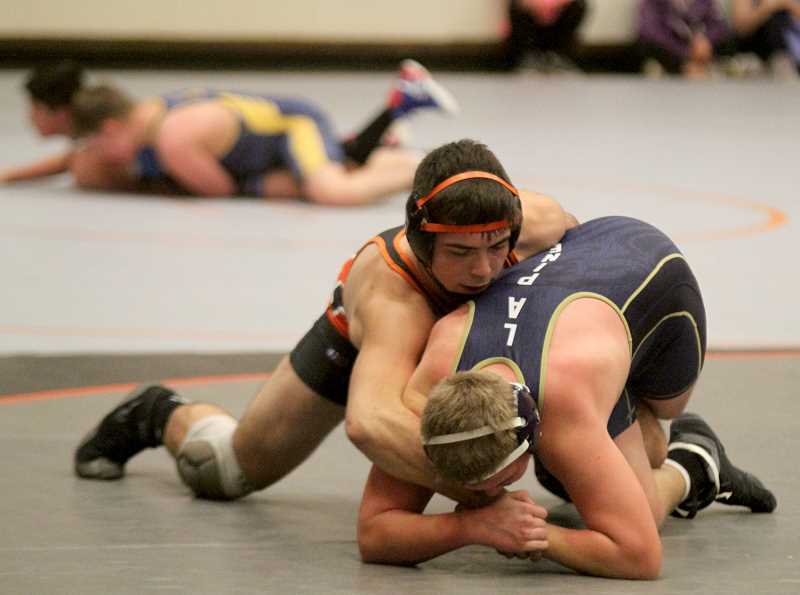 Elementary through high school wrestle in Hwy. 97 Classic on Culver mats, destroy Heppner tourney. The Culver Bulldogs hosted a very unique wrestling dual Jan. 29. They hosted La Pine in the Hwy 97 Classic, where Culver and La Pine elementary, middle, and high school, wrestling all competed at the same time. The idea came from La Pine head coach Aaron Flack, who did something similar in his time at Oakridge. The classic has evolved from the younger groups wrestling during an assembly, during school hours, trying to create interest for the youth, to what it is today. 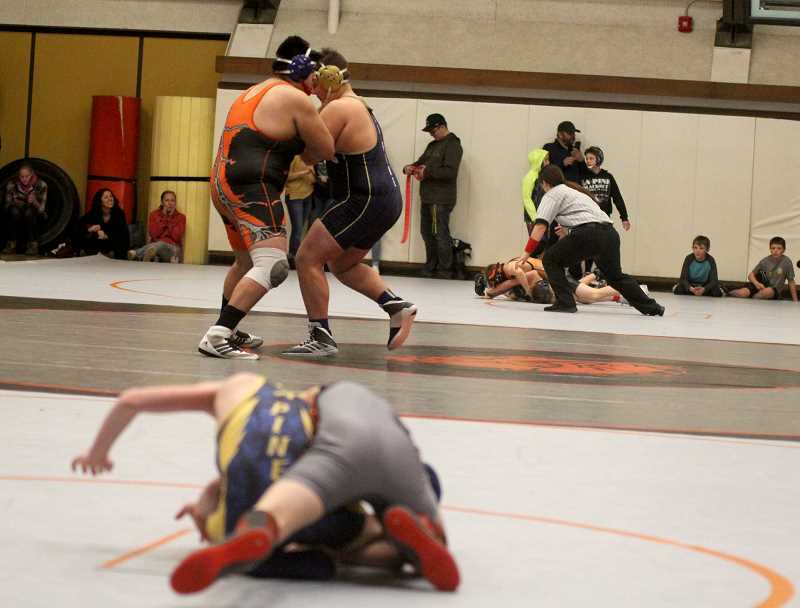 Three mats were laid out with middle school and elementary school athletes wrestled on each side of the high school match between the Bulldogs and the Hawks. All of the points are added up together and the total score is the winner of the Hwy 97 Classic. It was also senior night of four Bulldog wrestlers. Austin Spiller, Joe Russo, Cylus Hoke and Lorenzo Vasquez all wrestling their last match at Culver High School. "Really good group of the seniors," head coach J.D. Alley said. "One of the seniors, Austin Spiller, was with us in middle school and moved to a couple different places before coming back to Culver. He always seemed to like his Culver roots and maintain friendships here." "The other three (Russo, Hoke, Vasquez) turned into amazing kids," he said. "Never for one second did I ever have to worry about any discipline issues with those kids. Cylus and Joe are expected to share Valedictorian honors and that is pretty cool. It tells you the kind of kids they are." What Cylus and Lorenzo has meant alot to the club program as far as level of passion and commitment to our sport," he said. "Joe is a great three-sport athlete and Lorenzo and Cylus have been nothing but wrestling and has been instrumental to the program. Great role models and I have nothing but the best for all of those seniors. They are winners and we are lucky to have them. "I have had 29 seniors nights and not one of them have been easy," Alley said. "There is always at least one senior that you wonder how you are going to make it without them." Russo won by fall in 1-minute and 8 seconds at 182-pounds, while Hoke (195) won a 12-4 major decision. "This was a mix of emotions," Russo said. "A little happy, little sad, last home event, last time you get to perform this sport in front of the home crowd. We always hope to go out with a bang. It felt good to come away with a win on senior night. They whole team did great and I am very glad I was able to compete with this team." "I placed fourth at state and runner up at districts last year," he said. "The goal is always to improve. Hopefully I win districts this year, move on to state and win state." "People thought this would be a down year, but coach always says never bet against the Dogs, and we have been doing just fine. We are going to keep rolling and take it to state," said Russo. Spiller (152) lost a 10-5 decision and Vasquez (138) pinned his La Pine challenger in two minutes. The Culver High School team beat La Pine 43-27. "La Pine is dealing with some various issues and unfortunately are not the same team they were at the beginning of the year," Alley said. "Hopefully, things turn around for them before districts start." For the first time in around a four-year period, La Pine won their first Hwy 97 Classic 133-127. Even though Culver lost, the program's their goal was met. The goal of creating interest and excitement in the youth programs with parents being able to watch matches at all levels. High School wrestlers Isaiah Toomey and Noel Navarro were wrestling in the same classic at their brothers Isaac Toomey (elementary) and Santos Navarro (middle school). Something that I am sure they will remember for a long time. "It gives the kids and the parents a chance to look into all different levels of the program,' Alley said. "I think there is nothing but good things there. Not very often do parents get to watch their kids in different level schools compete in the same gym at the same time." Most recently the Bulldogs won the a tournament in Heppner. This was their last tournament until districts at Pine Eagle, Feb. 15-16. With 16 teams at the tournament, Culver scored 263 points to place first. Baker (196.5) and McGloughlin (127) finished in second and third. Vasquez (126) had another great tournament, pinning his first two victims in under 1:30 and pinning Alex Duran, of Baker, in 3-minutes, placing first. Sophomore Anthony Hood (132) pinned his first opponent in 2:41, but his next two matches were not as easy. He beat Colton Anderson (38-11), of Baker, in a very close 6-5 decision victory and won a 13-10 decision in his finals match over Enterprise wrestler, Shane Lund (36-4). Hood's victory placed him on the top podium. Hunter Augustynovich (145) also placed first for Culver. He pinned his first challenger in 4:23 and beat his second challenger in a 6-1 decision. Augustynovich only needed 38 second to pin his semifinals opponent and beat Logan Butcher (24-6) in a 8-4 decision. Isaiah Toomey (152) also had a very dominant performance in Heppner. His first two wins were by a 15-0 technical fall and a 12-3 majority decision. Toomey pinned both his semifinals and finals challenger, placing first. Russo (182) pinned his first two challengers and won a 11-2 majority decision over Christian Michaels, of Irrigon to claim the first-place trophy. Hoke (195) not only improved his record to 34-5, but also finished in first-place by pinning both of his opponents in less than 2-minutes. Jordan Piercy and Lane Downing both placed second for the Bulldogs and several other finished in the top five.